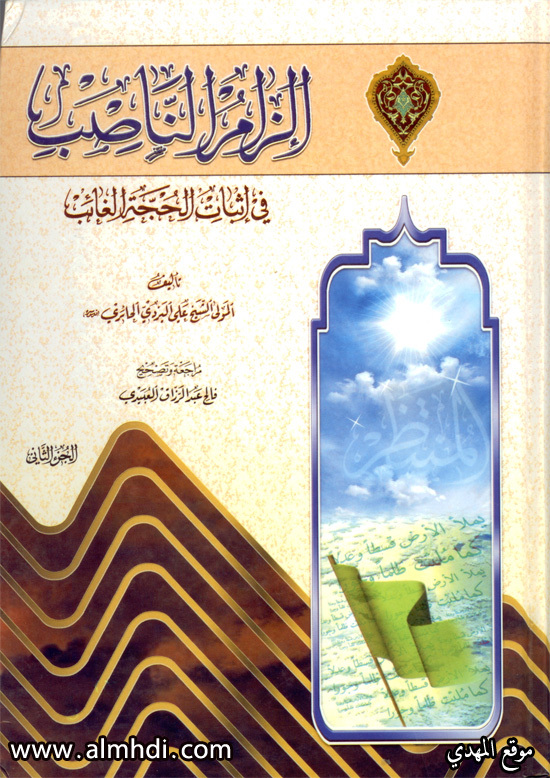 الجواب :باسمه جلت اسمائهنقلَ صاحب كتاب إلزام الناصب: أنّه إذا تمّت السبعون سنة، أتى الحجّةَ الموت، فتقتله امرأة من بني تميم اسمها سعيدة، ولها لحية كلحية الرجال، بجاون صخر من فوق سطح، وهو متجاوز في الطريق. وفوزه بالشهادة لا يتنافى مع بلوغ البشريّة قمّة الكمال، فإنّ الكمال للمجموع، وليس لكلِّ فرد فرد. Many of the faithful believers are wondering how the Imam Mahdi will die. If the Imam (AS) will get martyred , then his fate will be the fate of most of the Imams (AS), but since the occultation of the Imam – which is the perfection of mankind and their guidance to the religion – has lasted so long, this (him being killed) has not occured yet. What is your opinion? 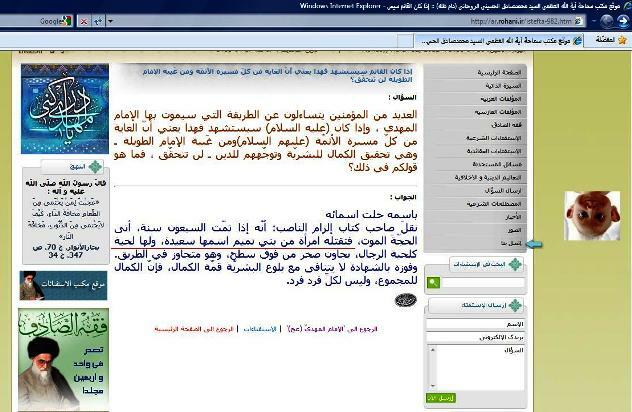 Website of one of the biggest Shia Marjaji’ alive, Ayatullat [Rabbi looking] Sadiq Al-ROUHANI. After shouting for thousands of years ‘Ya Imam Al-Zaman, Ya Mahdni, Adriknaa, Ya Sahib Al-Zaman’ etc., after giving him all the superman powers (that Allah has not given him, neither in the Qur’an nor authentic Sunnah), after asking him for help, wealth, health, children, after worshipping this one-eyed Persian-Mason Dajjaal, after all that, their deity will be killed by a WOMAN with BEARD! This is how the Indian Bollywood (or Karbalawood) film ends! P.S. ironically, the Rafidha accuse Omar Al-Farooq of being a coward. At least Omar died like a man. A BELIEVING man, leading the Sahaba AND Ahl Al-Bayt in FAJR prayer, then being stabbed by a Persian kafir named Abu Lu2lu2a the Majoosi the Shia idol. He was stabbed SEVERAL times. 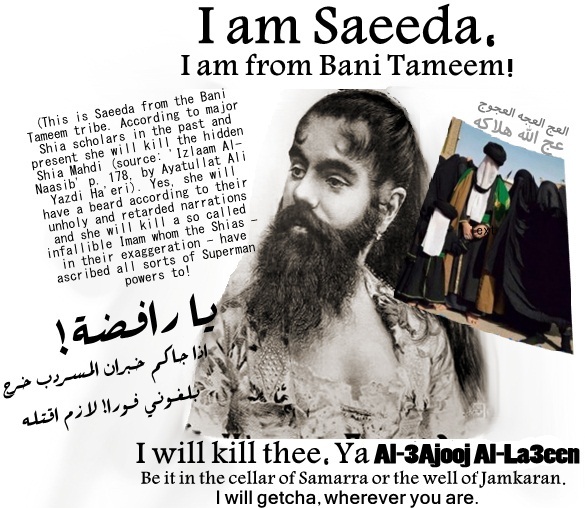 The Rafidha Mahdi, their hero will be killed by a TRANSEXUAL! WOW! What a man, what an end! 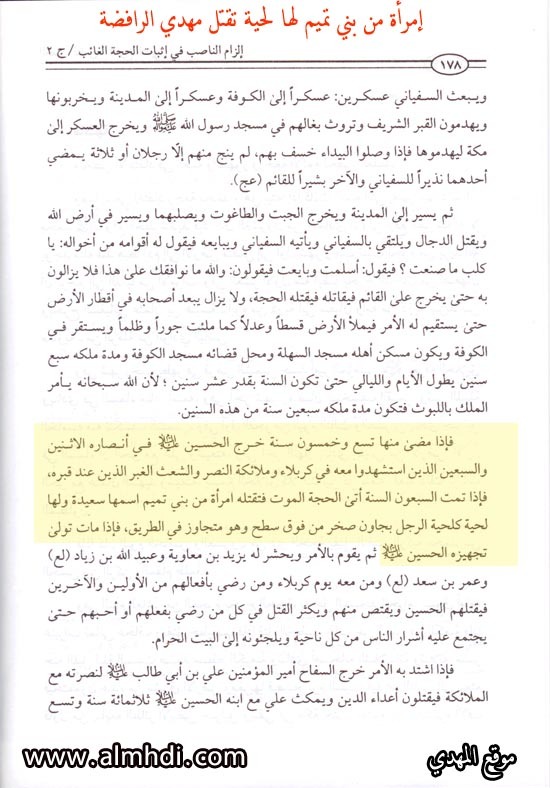 This entry was posted in Invented myths and legends, Shia Mahdi by Gift2Shias. Bookmark the permalink.